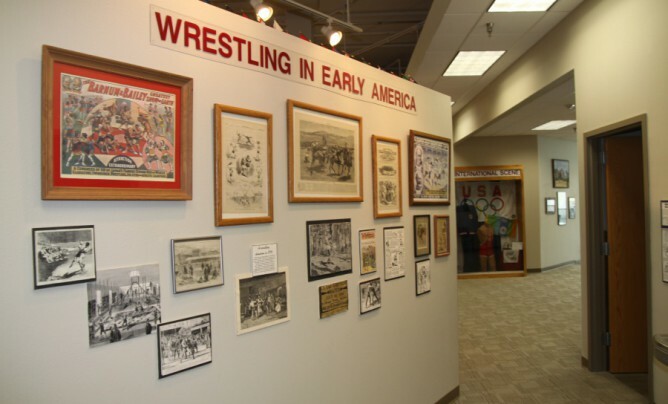 The wall entitled “Wrestling in Early America” gives museum visitors an overview of what wrestling was like in the days of the Native Americans, and when Colonists favored a style that came from Europe known as collar and elbow. Included are newspaper clippings and artwork that depict wrestling in its formative stages in the United States. One newspaper article from 1888 even shows “Wrestling on Horseback” – which featured one man on a horse trying to wrestle another off his horse.